When you have absolute power in a country, you get to do a lot of things that most other people don’t. For example, you get to have a lot of medals on your jacket. … and so many many more (and none of these are fictional). It’s good to be the king, or at least the President for life. Check out Joe and Azat for more about Turkmenistan and what it’s like living in a place with a president like this. And check out this review from Publishers Weekly. Check out my blog, too. Author Jesse LonerganPosted on December 7, 2009 Categories BlogTags Jesse Lonergan, Joe and AzatLeave a comment on Give That Man a Prize! So I kept things simple and I think it turned out all right. I also always liked Ted Rall’s drawings of Bush which weren’t the most accurate, but definitely gave you a clear impression of what Ted thought of him. So my Turkmenbashy is just a little bit cross eyed even though he wasn’t in real life. In my thoughts and in my heart. Let my hand be lost. Let my tongue be lost. … it’s a little bit more grim than the pledge of allegiance. Check out Joe and Azat for more about Turkmenistan. And check out these photos of the pit of hell (one of Turkmenistan’s most bizarre tourist attractions) by John Bradley. The Rukhnama is a truly amazing book. This is the quasi-political-spiritual-self-help-how-to-win-friends-and-dominate-people book written by Turkmenbashy (the former president for life of Turkmenistan). It was in all the schools in Turkmenistan while I was there. It was used in every classroom (I even saw it used in a math class). It was on sale in nearly every store. A copy was launched into space to orbit the earth, eternally protecting us. Turkmenbashy claimed that if you read it three times you would go to heaven. Words from the Rukhnama were even written on the inside of a mosque outside the city of Ashgabat (the inside of mosques generally being reserved for the Koran). So it was natural when it came time to do the cover of my book I would look to the Rukhnama for inspiration. Pink and green all the way! 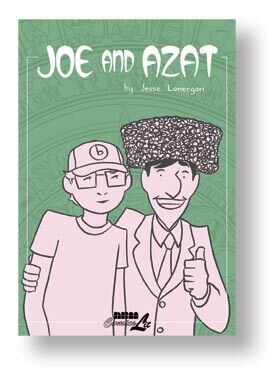 And you can also check out this review of Joe and Azat from the Comics Bulletin (I don’t think it’s been posted here yet). And check out my blog. And check out the arm on Matthias Schlitte! If you wanted to buy anything in Turkmenistan you had to go to the bazaar on Sunday. It was always jam jam jammed packed and you’d have to push your way through the crowd. Which is kind of like SPX, only instead of carpets, car parts and livestock people are looking through piles of comics. SPX also lacks the bartering that takes place in a Turkmen bazaar, though I think it would be awesome if that happened a little bit more. It would be great if slamming your fist, raising your voice and storming off in a mock rage only to return a few moments later were an integral part of buying a mini-comic. At least I think it would cool. Anyway, SPX was great. I sold a bunch of books, sold and traded a bunch of minis and sold all the prints of comics from my blog that I’d brought along (I really should have brought more of those)(oh well, I’ll know for next time). But I think the best thing about SPX was that I finally had copies of Joe and Azat and instead of talking about it I could actually put it in people’s hands. Well, it’s finally here. I should be getting copies of my book this week and hauling them down to D.C. this weekend. I’m excited. It feels a little like Christmas. Someday this week I’m going to come home from work and there is going to be a big box of my books waiting for me. Better than Christmas even. If you’re in the D.C. area you should come by SPX and stop by the NBM booth. Ted Rall will be there. Greg Houston will be there. It’ll be awesome. I’m getting some mini-comics to bring along made up today.